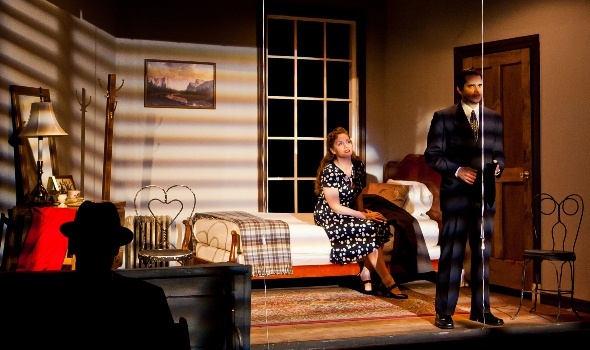 You could say The Den Theatre’s devoutly noir treatment of Don Nigro’s “City of Dreadful Night” is a picture of fine ensemble acting framed by sets, lighting and costumes that capture the story’s 1940s mystery film flavor. 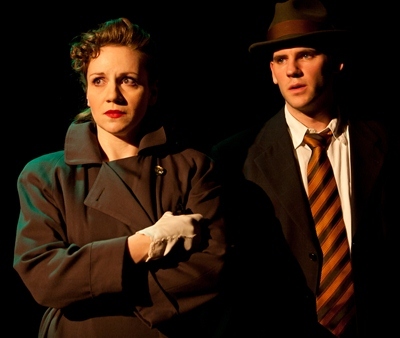 Or you could say this stylish gem is just the coolest thing to hit a Chicago stage in many a half-lit, shadowy night. Here’s the setup: It’s just after the war, late ‘40s. Anna, an out-of-town girl come to New York to find out what became of her sister who suddenly stopped writing, has latched onto Gus. He’s a small-time hood, and he can be a little rough. Still, Anna likes him. But Gus has begun to worry about Anna, wondering if maybe she’s seeing somebody, so he enlists a guy called Tony to tail her, see what’s what. Tony has his own problems, like this metal plate in his head, which he got after being wounded in the war. His memory isn’t always so good. And sometimes his fuse can be a little short, too. But Tony takes a liking to Anna. Thing is, she starts to put two and one together – meaning Tony and Gus and her sister, who happen to appear in a photo that the poor dame sent her before she suddenly vanished. Anna, who is not dumb, figures maybe both of these guys were in love with her sister, and one of them didn’t care for the little triangle and knocked her off. The closer Anna gets to Tony, the more certain she is that boyfriend Gus capped Sis. Maybe this whole thing isn’t as mysterious as it looks. Then again, maybe it is. That’s the beauty of The Den’s ultra-cool staging. You get caught up in the stylized dialogue – cryptic, circular, virtually uninflected, especially between Anna (Justine C. Turner) and Tony (Sam Guinan-Nyhart) – and end up drifting wherever its current pulls you. 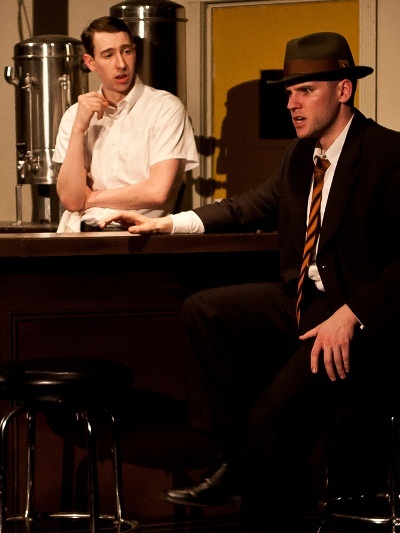 The perp could be Gus (Matthew Isler), loud and bullying, an obviously dangerous character. On the other hand, you can see that Tony is quietly lethal, and he can’t remember much from that time, though some light is starting to come through. But what about this other guy, Philly (Ben Hertel), the one who runs the cafe where you can get a coffee and any kind of pie you want so long as it’s cherry? He’s kind of goofy, jammers all the time. He has a history, too. Maybe there’s something we’re not seeing here. Not saying the answer’s in plain sight. Didn’t say that. But somebody killed the girl. Unless she maybe just blew town, walked away. Not saying she’s dead or she isn’t dead. Just seems unlikely we’d have this play if somebody didn’t kill her. I’m not naming names, but you got to give credit where it’s due, which means director Ron Wells and his production gang should do what no one else in this show ever does — step out into the full light and reveal themselves: set designer Henry Behel, lighting designer Cat Wilson, sound wizard Mikey Moran and costume designer Rachel S. Parent. One or more of these characters is also guilty of perpetrating the nifty movie-like credits that are screened before the play begins. 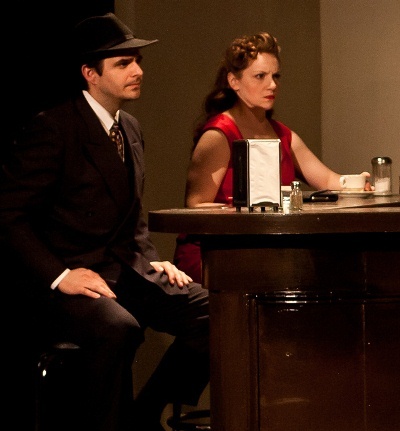 Still, in the end, it’s the on-stage foursome – dynamite-packed Gus, chattering Philly and especially laconic Tony and femme fatale Anna – who make you want to reach for some popcorn. The ticket price isn’t high enough to cover the bejeweled, necklace-like twists of dialogue between Guinan-Nyhart’s inscrutable Tony and Turner’s hyper, suspicious, distracted Anna. Bemused minds want to know: How did Turner learn that careening, convoluted part? One more thing. The last scene at the café. Check it out. I mean really look at it. The triangular bar, the lady in red seated beside the guy in the hat, with a third figure seated opposite them with his back to us. And Philly in the middle, with his two big coffee urns against the wall. 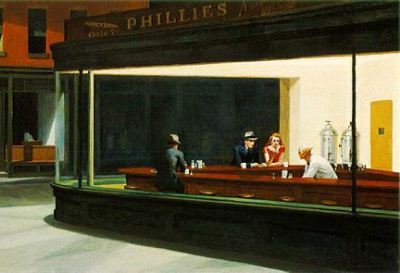 Now have a look at Edward Hopper’s iconic painting “Nighthawks.” Bingo. Question is, are the customers just having coffee, or what?